This is an important hour for the Nation, for those of our citizens who have completed their tour of duty and have moved to the sidelines. These are the days that we are trying to celebrate for them. These people are our prideful responsibility and they are entitled, among other benefits, to the best medical protection available. Not one of these, our citizens, should ever be abandoned to the indignity of charity. Charity is indignity when you have to have it. But we don’t want these people to have anything to do with charity and we don’t want them to have any idea of hopeless despair. 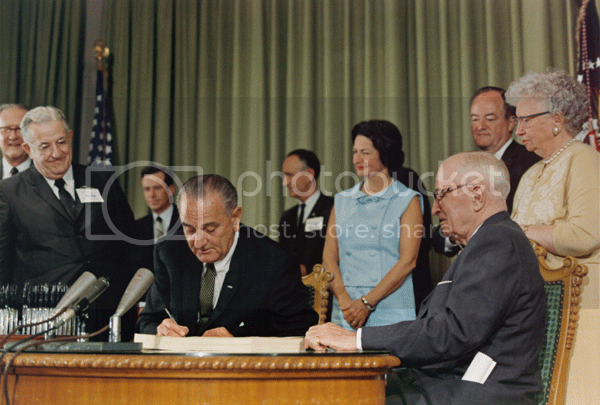 Mr. President, I am glad to have lived this long and to witness today the signing of the Medicare bill which puts this Nation right where it needs to be, to be right. Your inspired leadership and a responsive forward-looking Congress have made it historically possible for this day to come about. The people of the United States love and voted for Harry Truman, not because he gave them hell–but because he gave them hope. I believe today that all America shares my joy that he is present now when the hope that he offered becomes a reality for millions of our fellow citizens. I am so proud that this has come to pass in the Johnson administration. But it was really Harry Truman of Missouri who planted the seeds of compassion and duty which have today flowered into care for the sick, and serenity for the fearful. But it is just such men who illuminate the life and the history of a nation. And so, President Harry Truman, it is in tribute not to you, but to the America that you represent, that we have come here to pay our love and our respects to you today. For a country can be known by the quality of the men it honors. By praising you, and by carrying forward your dreams, we really reaffirm the greatness of America. Well, today, Mr. President, and my fellow Americans, we are taking such action–20 years later. PRESIDENT TRUMAN. Thank you very much. I am glad you like the President. I like him too. He is one of the finest men I ever ran across. You have done me a great honor in coming here today, and you have made me a very, very happy man. Well, today, Mr. President, and my fellow Americans, we are taking such action–20 years later. And we are doing that under the great leadership of men like John McCormack, our Speaker; Carl Albert, our majority leader; our very able and beloved majority leader of the Senate, Mike Mansfield; and distinguished Members of the Ways and Means and Finance Committees of the House and Senate–of both parties, Democratic and Republican. Because the need for this action is plain; and it is so clear indeed that we marvel not simply at the passage of this bill, but what we marvel at is that it took so many years to pass it. And I am so glad that Aime Forand is here to see it finally passed and signed–one of the first authors. There are more than 18 million Americans over the age of 65. Most of them have low incomes. Most of them are threatened by illness and medical expenses that they cannot afford. And through this new law, Mr. President, every citizen will be able, in his productive years when he is earning, to insure himself against the ravages of illness in his old age. This insurance will help pay for care in hospitals, in skilled nursing homes, or in the home. And under a separate plan it will help meet the fees of the doctors. The benefits under the law are as varied and broad as the marvelous modern medicine itself. If it has a few defects–such as the method of payment of certain specialists-then I am confident those can be quickly remedied and I hope they will be. And this bill, Mr. President, is even broader than that. It will increase social security benefits for all of our older Americans. It will improve a wide range of health and medical services for Americans of all ages. Well, perhaps no single act in the entire administration of the beloved Franklin D. Roosevelt really did more to win him the illustrious place in history that he has as did the laying of that cornerstone. And I am so happy that his oldest son Jimmy could be here to share with us the joy that is ours today. And those who share this day will also be remembered for making the most important addition to that structure, and you are making it in this bill, the most important addition that has been made in three decades. History shapes men, but it is a necessary faith of leadership that men can help shape history. There are many who led us to this historic day. Not out of courtesy or deference, but from the gratitude and remembrance which is our country’s debt, if I may be pardoned for taking a moment, I want to call a part of the honor roll: it is the able leadership in both Houses of the Congress. Congressman Celler, Chairman of the Judiciary Committee, introduced the hospital insurance in 1952. Aime Forand from Rhode Island, then Congressman, introduced it in the House. Senator Clinton Anderson from New Mexico fought for Medicare through the years in the Senate. Congressman Cecil King of California carried on the battle in the House. The legislative genius of the Chairman of the Ways and Means Committee, Congressman Wilbur Mills, and the effective and able work of Senator Russell Long, together transformed this desire into victory. And those devoted public servants, former Secretary, Senator Ribicoff; present Secretary, Tony Celebrezze; Under Secretary Wilbur Cohen; the Democratic whip of the House, Hale Boggs on the Ways and Means Committee; and really the White House’s best legislator, Larry O’Brien, gave not just endless days and months and, yes, years of patience–but they gave their hearts–to passing this bill. Let us also remember those who sadly cannot share this time for triumph. For it is their triumph too. It is the victory of great Members of Congress that are not with us, like John Dingell, Sr., and Robert Wagner, late a Member of the Senate, and James Murray of Montana. And there is also John Fitzgerald Kennedy, who fought in the Senate and took his case to the people, and never yielded in pursuit, but was not spared to see the final concourse of the forces that he had helped to loose. But it all started really with the man from Independence. And so, as it is fitting that we should, we have come back here to his home to complete what he began. President Harry Truman, as any President must, made many decisions of great moment; although he always made them frankly and with a courage and a clarity that few men have ever shared. The immense and the intricate questions of freedom and survival were caught up many times in the web of Harry Truman’s judgment. And this is in the tradition of leadership. I said to Senator Smathers, the whip of the Democrats in the Senate, who worked with us in the Finance Committee on this legislation–I said, the highest traditions of the medical profession are really directed to the ends that we are trying to serve. And it was only yesterday, at the request of some of my friends, I met with the leaders of the American Medical Association to seek their assistance in advancing the cause of one of the greatest professions of all–the medical profession–in helping us to maintain and to improve the health of all Americans. And perhaps you alone, President Truman, perhaps you alone can fully know just how grateful I am for this day. Medicare is under attack again in 2015 by the wealthy men (and woman) running for president in the 2016 GOP primary, people who will never have to worry about whether they will be able to afford health care when they get older. DON’T let them destroy this program that ensures health care for our elderly and disabled. “Democrats believe that Medicare is a bedrock promise: after a lifetime of work, seniors deserve the security Medicare provides. Yet Republicans are determined to end Medicare as we know it, passing plans that turns Medicare from a guaranteed benefit program into a privatized voucher program, ultimately increasing seniors’ health care costs by thousands of dollars a year.